Muthoot Finance got over subscribed 7.09 times till today. The IPO closed today for QIB bidders and tomorrow for retail and HNI. This indicates a likely surge tomorrow in the latter two categories. Primary Product – Small consumer Loan against gold (jewellery/ coins) as collateral. As per the company, the maximum tenure for a gold loan is one year, while the average tenure is three to six months. The cost of borrowing is 9.5% (may increase by 1% soon), while their loans start at 12%. Muthoot’s network stands at 2500+ branches across India employing 15000+ persons. At the same time, having Gold as collateral for personal loans provides for a low risk model to Muthoot, comparable to Home loans. Other loan categories are riskier. The loan-to-value ratio for a 22 carat jewellery piece typically varies from 55- 65% for banks while it increases to 70 – 80% for NBFCs like Muthoot. High brand recall due to recent ad campaigns and high visibility branch locations. 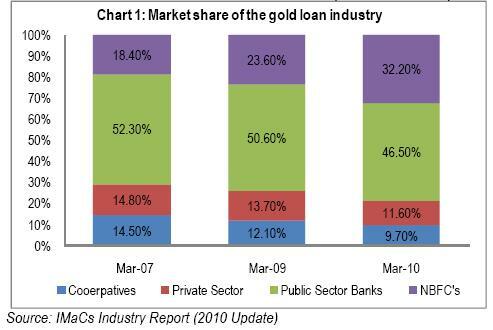 There are very few Gold loan only players – listed Mannapuram General Finance comes to mind. Most other players are Banks, and NBFCs having a broader loan portfolio. 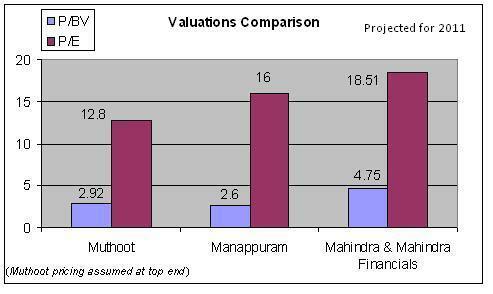 In that sense, Muthoot is a leader. 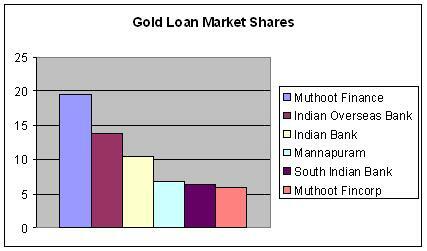 Growth Potential – Muthoot’s gold loan book of Rs 13,000 crores (Nov 2010), is expected to grow by Rs 10,000 crores in one year. 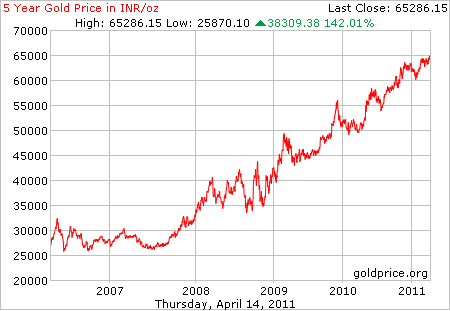 As of November 2010, Muthoot holds 97 tonnes of gold. NBFC sources estimate the gold held by households in India at 20,000 tonnes out of which 10% (2,000T) is held by lenders across the country. Of this 10%, only 25% (500T) is with the organised players like NBFCs and banks. So there is visible potential for this organised market to grow. A recent RBI directive says that bank credit to NBFCs for giving loans against gold jewellery will not be treated as exposure to priority sector. This will raise Muthoot’s cost of funds by 50 to 100 basis points. 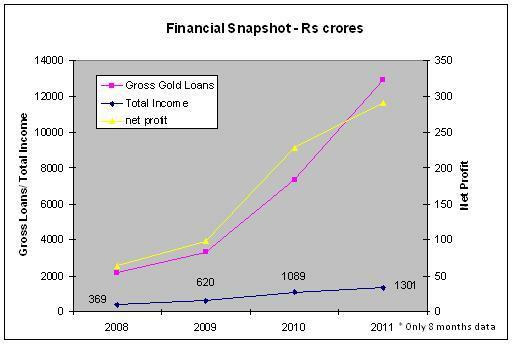 For the past three fiscals, Muthoot Finance had negative net cash flows. This is unhealthy. The company explains in its RHP that it is primarily on account of high growth in borrowing under financing activities for the purpose of lending under operating activities. But also Muthoot is investing heavily in additional branches and employees. There are a number of civil, criminal, consumer, and tax cases by and against Muthoot and group companies. One pending in the SC is related to the Kerala Money Lender’s Act (KML). Any adverse ruling here can curb operations in Kerala. Muthoot Finance has agreed to sizeable royalty payments to promoters for the Brand. There are also anti-dilution guarantees provided to four institutional investors – Baring, Matrix, Wellcome, & Kotak – these are concerns left unaddressed. Complex web of 55 Promoter group companies are mentioned in the RHP. Some are in similar or related businesses. There is no clear future path on conflict of interest, M&A by promoters, etc. Fall in price of Gold. This is not expected in the immediate future, but in a 3-5 year period, there may be a sharp appreciation followed by a sharp fall in prices. This can expose Muthoot to a collateral risk. The IPO proceeds will be utilised to meet the company’s capital adequacy norms (>15%) in the future, funding of loans and for general corporate purposes. 7% of the equity capital is held by PE players like Baring India, Matrix Partners, Kotak India PE Fund and Wellcome Trust. Very good research, especially simple to understand and very clear advice. Thanks. Thanks for your kind words. Have you subscribed for my Post updates?